Royal Scientific Society, Water and Environment Centre, Jordan. Water and Environment Centre, Jordan. This paper aims at documenting the experience of the Royal Scientific Society (RSS) of Jordan in conducting a changing behavior- social marketing and advocacy - study that targeted local communities in the Northern Governorates. The study aimed at increasing the water and energy use efficiency at household level by targeting youth, Community Based Organizations (CBOs), and AL-WAETHAT (religious woman guides) for the purpose of formulating efficient advocacy groups to contribute in solving their water- energy problems and change improper water related behaviors and foster good ones. By using social marketing tools, the youth and other targeted groups were able to reach 5635 households and encourage them to adopt water saving devices and energy saving bulbs. Water and Energy Demand Management, Youth, Behavior Change, Social Marketing and Advocacy. Social marketing is an approach used to develop activities aimed at changing or maintaining people’s behaviour for the benefit of individuals and society as a whole . It is a systematic and planned process, it follows six steps; getting started, scope, develop, implement, evaluate, and follow up. The key concept is that social marketing is an exchange process, same as commercial marketing, but it focuses on “selling” behaviors, i.e. promoting the benefits of adopting a new behavior . Research in Jordan shows that the general public does not have a comprehensive understanding of the state of water resources, they understand scarcity from the rationing they experience every day, but not the stark issues that face the country . In fact, water is the decisive factor in the population/resources equation. Whereas water resources in Jordan have fluctuated around a stationary average, the country’s population has continued to rise. A high rate of natural population growth, combined with periodic massive influxes of refugees, has transformed a comfortable balance between demand and available water supplies in the last two decades into a chronic and worsening imbalance. Current demand already exceeds renewable supplies, the deficit is covered by the unsustainable practices of overdrawing highland aquifers, resulting in lowered water tables and declined water quality . The situation has been exacerbated by the fact that Jordan shares most of its surface water resources with neighboring countries, whose control has partially deprived Jordan of its fair share of water. (CBOs), and AL-WAETHAT (religious woman guides) in the targeted four northern governorates (Jerash, Al-Mafraq, Ajloun, and Al- Ramtha) for the purpose of formulating efficient advocacy groups to contribute in solving their water- energy problems and change improper water related behaviors and foster good ones. a) Project core team formulation: Several meetings were held with the project key partners, i.e. Higher Council for Youth, Women Affairs Directorate, Community Based Organizations, Al-WAETHAT the youth centers and the youth directorate in each of the targeted areas. b) Nomination of official representatives: The selected Community Based Organizations (CBOs) in the targeted areas nominated their representatives to follow up the project activities. Women Affairs Directorate at the Ministry of Islamic Affairs also nominated three WAETHAT to follow up project activities. c) Project launching workshops: During the launching workshops the project objectives and methodology were discussed with the concerned parties, and the water and energy problems in the north were addressed and explained, and then the pivotal role of youth, CBOs and Al-WAETHAT that they can play in reducing the demand on water and energy were discussed, after that an application form was distributed and filled in by the interested attendees. Based on that, the advocacy groups were formulated. a) Semi-structured interviews: with governmental institutions, community members and farmers. b) Observations: field visits to water resources, farms and households. c) Background information: previous official reports and media reports. In order to achieve project behavioral goal, the capacity of WEEGs members was built in several human and technical fields. d) Soft skills including communication and presentation skills. The practical training demonstrations took place by installing Water Saving Devices  and Compact Fluorescent Light Bulbs (CFLs) in more than six hundred households in the targeted areas. This practical demonstration highlighted the efficiencies of such devices in water and energy conservation. The well trained members started transfer their knowledge to their peers in their societies, including youths, WAETHAT, and other CBO’s. For example, the youth invested national occasions such as; Al-Hussein Summer Camps in order to transfer their new knowledge to their peers. Furthermore, two national conference meetings were conducted in order to exchange their success and challenges stories, with other youths who are involved in similar projects. Also WEEGs youths started formulating environmental clubs with other interested youths from their schools and universities in order to achieve the project behavioral goal. While the main three Al-WAETHAT and CBOs started transferring their knowledge to other nine local CBO’s and ninety WAETHAT in the targeted areas, and convince them to insert the water efficiency concept in their religious lessons that targeted housewives by using religious guideline. After that social plans were developed by the project partners in order to achieve the project behavioral goal. Upon the completion of the capacity building campaign, the social marketing plans were developed and scheduled. The WEEG trained members i.e. youth, CBOs and AL-WAETHAT started to conduct outreach activities within their communities. The objective of this component was to convey certain action messages focused on water and energy conservation and efficiency to as much community members as possible. The action messages were: “Buy aerators”, “Install aerators”, “Use aerators”, “Buy CFLs”, “Use CFLs”, etc. WEEGs organized meetings with all society categories to increase their understanding in water and energy issues and launched interactive initiatives to demonstrate the effectiveness of WSDs and CFLs in water and energy conservation. a) An institutional framework for the committees in the North; including vision, aims and roles were drafted and discussed with all stakeholders. b) The work plan for each committee will be embedded in the work plan of the designated CBO. c) The committee is asked to send quarterly-based reports to RSS and development office in the municipality/ Ministry of Interior. The report will include activities realized, problems encountered and achievements. d) Facebook page: The page was launched at the beginning of the project. The page is being used by the committee to facilitate communication and promote good environmental social behaviors. All activities done and planned are being published on the page. Moreover, the page has been used as a tool to advertise commission activities and get more youth involved in commission works, and transfer knowledge to other youths. By the completion of water and energy situational analysis, the WEEGs were able to come up with the common water and energy problems in the targeted areas (Jerash, Ajloun, Al-Ramtha, and Al-Mafraq) as shown in Table 1. Based on that, the behavioral goal was tailored in collaboration with WEEGs members. The behavioral goal was to improve the efficiency of water by using water saving devices on the household level and to make the supplied domestic water quantity sufficient for all domestic uses through promoting and instilling good behaviors. On the energy side, the goal was to decrease the demand on energy at household level by using the fluorescent bulbs and promoting good energy- related behaviors. Table 1: Common water problems in the targeted areas. a) Community/participants satisfaction was measured by using surveys and structural interviews. b) Each field officer (i.e. governorate coordinator) had to fill in particular form after each activity. c) Frequent meetings of monitoring and evaluation team with field coordinators were held on regular basis to follow up the implementation and ensure that all activities are being conducted according to the project plan. The main indicators were drafted as shown in Table 2. Table 2: Monitoring and evaluation indicators. by CBOs and adopted water saving devices and energy saving bulbs were above the proposed target by three times. Likewise, the actual number of households reached by youth and adopted water saving devices and energy saving bulbs was six folds higher than the proposed target. Figure 1 shows the proposed target and actual achievement for each indicator. Figure 1: Comparison between the proposed target and the actual achievements of some project indicators. Knowledge and attitudes towards water and energy savings were also tracked by using structural questionnaire, before and after the training sessions. The training covered all technical and behavioral aspects related to water and energy demand management concept, including, but not limited to, using water saving devices, using florescent bulbs, turning off lights during off hours and using agricultural water saving practices . The difference of knowledge before and after training is shown in Figure 2. Figure 2: The change of trainees’ knowledge before and after training sessions. As shown in Figure 2, the percentage of trainee who was able to give correct answers after training had significantly increased, implying the effectiveness of the training sessions in improving participants’ knowledge and attitudes towards water and energy savings. The difference was clearly noticed in questions number 12, 13, 14, 16 and 18 in the questionnaire Table 3. Table 3: List of questions, whose answers’ had substantially changed after training. *The question after training was: do you intend to have solar water heater for your house? The efficiency of water and energy saving devices were investigated by surveying more than 1800 households in the three areas. The survey was conducted twice, at the time of devices installation and after 3- 4 months of installation. Beneficiaries were asked whether they have been able to save water and energy by using water saving devices and florescent bulbs. The results are shown in Figure 3. Figure 3: Response of beneficiaries after 3-4 months for installation of water and energy saving devices. The results shown in Figure 3 were rather interesting. The percentage of people who are still using the water saving devises was about 92%, referring to the great satisfaction of users. Based on the situational analysis which was conducted before project onset, the freshwater supply in the targeted areas is intermittent and insufficient to cover all people needs. Interestingly, 96% of water saving devices users noticed that freshwater has become available longer than before. The saving on electricity bills was also addressed in the survey. It was found that 65% of beneficiaries noticed 1-5 JD saving on bills. However, long-term evaluation might be needed to come up with solid conclusion and evaluate the cost effectiveness of these devices Figure 4. 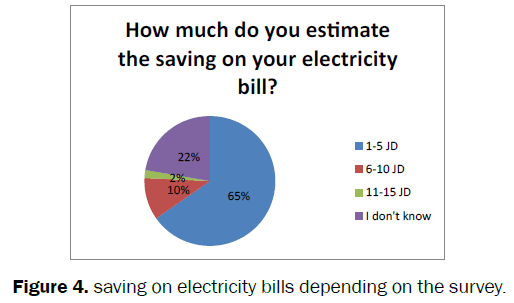 Figure 4: saving on electricity bills depending on the survey. This project investigated the efficiency of using social marketing techniques in promoting good behaviors related to water and energy conservation and eliminating bad ones. This research project emphasized the findings of similar research conducted by Evans  who reviewed all articles on social marketing associated with water and concluded that social marketing is an attractive and persuasive measure to enhance values related to water and sanitation. This research project adopted the 4 Ps strategy to promote the intervention i.e. product, place, price and promotion, where the product was the water saving devices and fluorescent bulbs; the place was the targeted areas (northern part of Jordan), the price was identified by looking at the drivers and barriers for the adoption of the intervention, and the promotion was mainly conducted through the community members, i.e. WEEGs. This was in agreement with Pinfold , Ahmed  and Donger  who all found that using 4 Ps is a valid strategy for robust social marketing plans. Community involvement and stakeholders dialogues were used actively in this project. This participatory methodology has made the issue of water demand management everybody’s concern. The importance of community participation is stressed by Dalahmeh , who studied the theme of stakeholder participation in greywater management in Jordan and concluded that the incorporation of inputs from a broad range of sectors and stakeholders during the project insured cooperative management of the resources and enhanced project quality and ownership. Water saving devices was proved to be efficient tool to cope with water scarcity conditions. This was in consistence with the findings of water efficiency and public information for action project –WEPIA, where nearly 14 MCM was the potential water saving if all large water consumers are equipped with water saving devices. The level of satisfaction over the adopted intervention was quite high, implying that users are happy with the saving devices performance. Based on the social and financial survey, this research pointed out that using saving devices is economically feasible option, which was consistent with WEPIA project (2000) who reported 2.56 years pay-back period for the water saving devices. The energy saving bulbs was observed very efficient and feasible with saving ranged between1-15 JD on the electricity bills which was in agreement with Houri  who investigated the efficiency of fluorescent bulbs in Lebanon by replacing around 1000 conventional light bulbs and found that 8.3% of energy has been saved within a specific period of time. It was concluded that knowledge about an issue is not enough to create change, the key is to involve the local communities members in the process of making decisions and taking responsibility for those decisions, so they have ownership, responsibility and passion to practice and advocate for behaviors needed for water conservation, and while efficient water technologies play a vital role in reducing water consumption, personal and social behaviors associated with water conservation are also important to practice. Promoting and sustaining these behaviors will create habits that are an important part of the systems approach to water demand reduction. Additionally, it should be mentioned that the private sector has strong experience and knowledge of the problems facing water, energy and solid waste sectors, nevertheless, private sector lacks the soft science skills to conduct communication or social marketing. Therefore, building the communication tools of the partners in any project is an agent for behavioral change in the communities, and should be identified during the project preparatory phases. NSMC, International center of behavior change expertise 2014. Public Action for Water, Energy and Environment Project (PAP)/USAID. Behavior Change - Qualitative Research Findings2010. Abdel Khaleq RA, Dziegielewski DA, national water demand management policy in Jordan. Management of Environmental Quality: An International Journal2006; 17: 216- 225. Ministry of Energy and Mineral Resources. Annual Report 2011. Public Action for Water, Energy and Environment Project (PAP)/USAID. Survey Finding of Young People’s Knowledge Attitudes & Behaviors on Environmental Issues: Water & Energy Conservation & Solid Waste Management. Informal & Non-Formal Sectors. Final report2010. WEPIA -Water Efficiency and Public Information for Action. Assessment of Water Saving Devices (WSDs) in Jordan, Submitted to USAID as part of cooperative agreement No. 278-A-00-00-00201-00. Evans W, et al, Social marketing of water and sanitation products: A systematic review of peer-reviewed literature, Social Science and Medicine2014; 110: 18-25. Pinfold JV and Horan NJ, Measuring the effect of a hygiene behavior intervention by indicators of behavior and diarrheal disease, Transactions of the Royal Society of Tropical Medicine and Hygiene 1996; 90: 366-371. Ahmed NU, et al, A longitudinal study of the impact of behavioral change intervention on cleanliness, diarrheal morbidity and growth of children in rural Bangladesh. Social Science & Medicine1993; 37:159-171. Dongre, et al, Effect of use of socially marketed faucet fitted earthen vessel/sodium hypochlorite solution on diarrhea prevention at household level in rural India. Online Journal of Health and Allied Sciences 2008; 7: 1. Dalahmeh S, et al, Themes of stakeholder participation in greywater management in rural communities in Jordan, Desalination2008; 243:159-169. Houri Aand El Khoury P, Financial and energy impacts of compact fluorescent light bulbs in a rural setting. Energy and Buildings2010; 42: 658-666.